This topic has 2 voices, contains 9 replies, and was last updated by TB Support 672 days ago. I have instaled SEO pack. No corection inside – just sow there and all is “on”. You see – just product url is good. “A CATEGORY” – url is (/category) BUT NOT ALL THERE IS GOOD – url must be not “categorie” but “a-categorie”. “C SUBCATEGORY” – url is (c-subcategory) ALL IS GOOD and I need just one time “edit” product after first save. Is this SEO pack is working like this? Is this normal you think? Can you please check the admin credentials? We were not able to login. Please read attentive, login again and you will login. All credentials is good, no need edit. I tried again login with credential wat I writed here and no problems. I think in admin field you writed what usually writing most users At this time in admin field is not ‘Admin”. But maybe you incorrectly wridet credentials in another field. ALL IS TESTED AND ALL IS OK.
You need to use the Generator tool in the SEO extension. What do you mean I need use Generator? Yes I was in this http://i.imgur.com/e0Dtl33.png page. I was push “GENERATE” button. ??? I push that before creating categorie, after ant what. In web browser I see … product/category?path=224_233. ??? Now is better. Now I need just two times open categories page not three What do you mean? Can you say step by step what I must do if I want url was friendly seo. 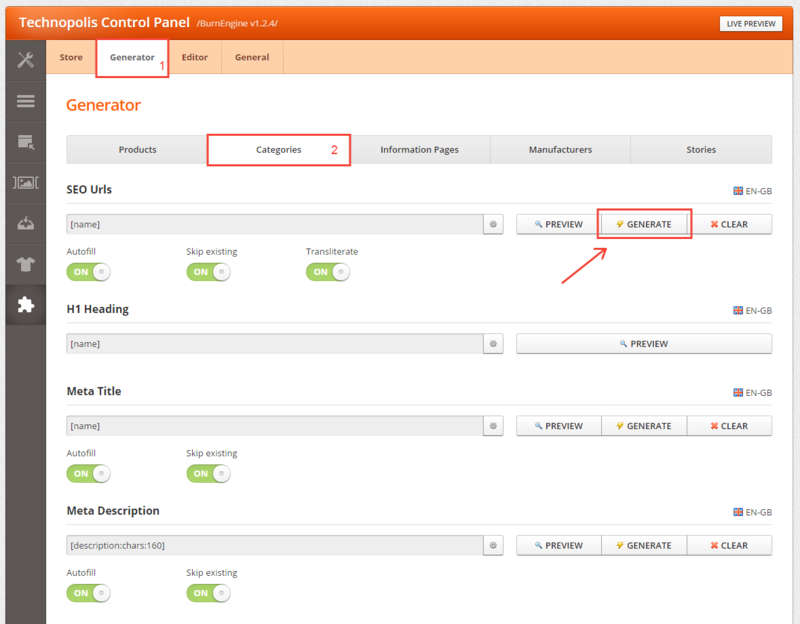 Every time if I creating some categorie or subcategorie I must push some generator button? Do you know how It’s working for me. 1. Firs I’m creating categorie one or few. This SEO pack working like this? If yes better I say nothing about seo pack … more faster write in seo fiel manualy. But I hope this system working otherwise. 1) It seem there is a problem with OC 2.3.0.2 when adding new categories. Generally, you should not click on the “Clear” button. We will check about this issue. 2) Will check the why the “Autofill” option is not working as supposed. Url autofill should now work with your categories. We’ve applied a patch to your installation. You don’t need now to generate urls manually. Hope you can reconsider your rating! This problem was not a show stopper and was not easy to fix.